Browse our Selection of Rental Villas in Phuket – Find your ideal holiday accommodation with THH today! 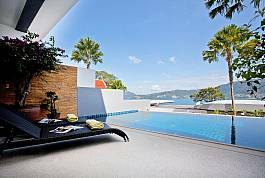 Please take your time to have a look over our vast array of rental villas available in Phuket. We have worked long and hard to put together one or the widest selections of villa listings in the location while not overlooking quality. We take great pride in what we do so each of the properties listed here on our site has gone through a vigorous quality control process so we are safe in the knowledge that you, our valued customers will enjoy the fantastic holiday you deserve. We have also been in the market for over 10 years so have the experience and contacts to ensure we can offer the best rates and pass on great value for money to our clients. If you are looking for a commodious, modern and quiet villa suitable for a family holiday, Villa Fullan is a great pick. The 3 bedroom house is fantastic for relaxation; it features a private pool with waterfalls and a charming deck, indoor and outdoor dining, BBQ, and two balconies. This secluded and contemporary property with an electric gate is a great holiday abode for families. Whether you choose to spend your days laying by the pool or discovering some of Phuket’s countless exciting sites, Villa Elina is a holiday home you will happily remember. If you enjoy holiday abodes with character and flair, this villa with a salt water pool and a huge lawn will surely leave a lasting impression. Capacious, tranquil, unique and carefully appointed, Villa Tallandia is set in the south of Phuket near Friendship Beach. Modern and unique, this custom-built Italian style villa with sandstone walls and an indoor pool promises an extraordinary kind of holiday. Two in-house Jacuzzis, TV in every room, and wonderful sea and mountain views are just some of the special touches you will find here. Warm and spacious, Yu-Pha Villa is a charming rental suitable for families with children and situated in a well-connected part of Phuket. The villa offers privacy and security along with magnificent mountain and jungle views, a private pool and a large balcony with loungers. 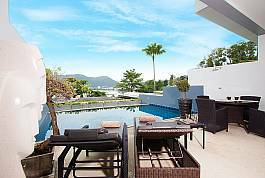 Located in Kamala Bay, Phuket, this gated resort villa has a host of onsite amenities and is just a 2 km drive to Kamala Beach. The accommodation itself boasts 3 modern bedrooms, spacious living area, and a private pool with lounging deck. The 3 bedrooms on the upper floor of Bang Tao Tara 4 include a spacious en-suite master bedroom and a backdrop of mountains as well as town views. There is a comfortable open-plan living space on the ground floor and a very pretty garden with private 30sqm swimming pool featuring a small waterfall to the rear. Seductive Sunset Villa Patong is a chic 3-bedroom villa in Patong with spectacular views of the Andaman Ocean. 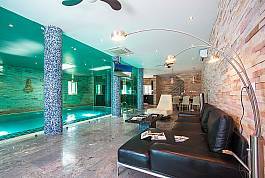 The villa has its own private swimming pool, a modern interior design and a rooftop terrace. 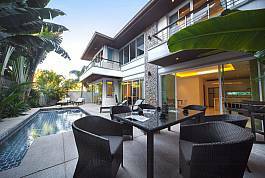 Located just 1.3 km to the beach, the villa is situated in Phuket’s most popular beachside location. The development is situated on hill side therefore the access roads are sloping and not flat. 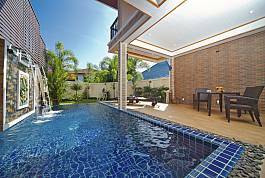 Situated on a quiet street just outside Patong City, this 3 bedroom villa sits a mere 1.5 kilometers away from the beach, a myriad of restaurants, and the best shopping on the island. This 5-star and ultra-modern modern villa has panoramic views over the Patong Bay, and promises to make all your Thailand holiday dreams come true. The development is situated on hill side therefore the access roads are sloping and not flat. A brisk 500m walk from Kamala Beach, Phuket, the modern Villa Romeo gives guests privacy, quietude and the convenience of an unbelievable location. With a private pool, 3 bedrooms, and a host of amenities, your search for a holiday home can end here. 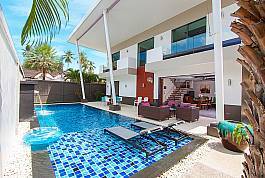 Not only do we have one of the largest selections of rental villas in Phuket online but we also offer great value and pride ourselves on the highest level of customer service. Saying this, we will work hard with you and go over and beyond to help find the best Villa to suit your wants and needs. We have great local knowledge so can offer advice on which location would be best for you and what type of property. 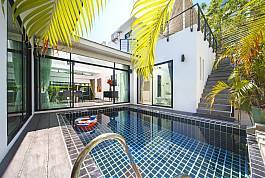 We have Villas in all local districts in Phuket and villas to suit a wide variety of budgets. You will find beach villas from as a little as 5,000 THB per night and of course luxury villas with in-house chefs, outside BBQ areas and large pools for you, friends and family to enjoy while on holiday in this tropical paradise. Take a look and get in touch today if you require further assistance.